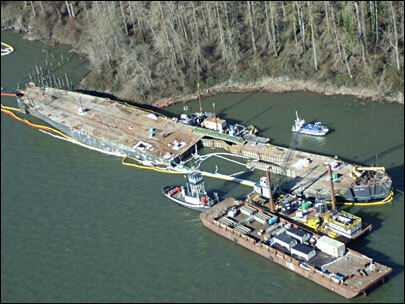 The Washington man whose botched salvage of the derelict barge Davy Crockett ended up spilling pollution into the Columbia River pleaded guilty this morning to two criminal violations of the Clean Water Act. Bret A. Simpson, a scrap dealer from Ellensburg, Wash., pleaded guilty to failing to report an oil discharge and unlawfully discharging oil into the Columbia River near Camas, the U.S. Attorney's Office for western Washington said. Simpson purchased the 430-foot converted World War II Navy vessel in June 2010, prosecutors said, was told it had thousands of gallons of fuel oil and diesel aboard, but did not remove the contamination before authorizing workers to scrap it in December 2010. The barge cracked open, spilling oil, but neither Simpson nor anyone else with his company, Principle Metals, notified authorities about the leak, prosecutors said. The U.S. Coast Guard spent eight months and approximately $20 million working with environmental regulators to clean up the spill and remove the derelict barge from the river. The failure to report offense is punishable by up to five years in prison, while the unlawful discharge offense is punishable by up to one year in prison. Sentencing before U.S. District Judge Robert J. Bryan is scheduled for Oct. 14.